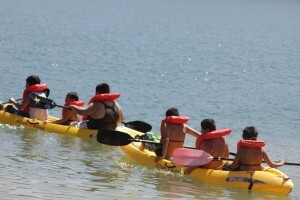 Children kayak at the Aquatic Center at Castaic Lake. Photo by Josh Hernandez. More than 100 children from Los Angeles County will get to experience the great outdoors — most for the first time in their lives. The county is partnering with California State University, Northridge’s Aquatic Center at Castaic Lake to provide youth from the Department of Family and Child Services (DFCS) and the Los Angeles Police Department’s (LAPD) PALS program to host the second annual Youth Recreation Day, at no cost to the children and their support on Saturday and Sunday, Oct. 15 and 16. The recreation day will include classes on water and boating, opportunities to kayak and canoe, ride an ATV and more provided by Los Angeles County and is funded in part through a grant received by the Department of Boating and Waterways. CSUN Aquatic Center Executive Director Nathan Martin said the event is an opportunity for youth in different environments to connect to the outdoors, which could have lasting effects on their futures. Martin noted that the days provide the youth with more chances to explore their potential as members of a community. For more information on CSUN’s Aquatic Center at Castaic Lake and the services it provides, visit http://www.csun.edu/health-human-development/recreation-tourism-management/aquatic-center-castaic-lake.